PollEverywhere.com enables teachers to generate questions in PowerPoint or Keynote for students to respond to with their mobile devices in real time. It is an interactive classroom response system for questioning and receiving feedback from students, highly useful for starters, plenaries, enhancing engagement, and promoting deep learning through open ended responses in addition to recall. Students are able to answer questions via any device such as their smartphones, tablets, laptops, any device connected to the internet and even old school mobile phones through a text message. The students responses are instantly displayed on the poll, facilitates an interactive learning environment and evaluation of the students knowledge and understanding can be determined through their communication. The video demonstrates how to set up a poll (question) and insert it into a PowerPoint or Keynote slide which can then be used as part of a presentation. I've extensively use it to gage the understanding of the whole class periodic during the lesson as up to 50 responses can be submitted with the free account. The process of setting up a question is straight forward and be completed in literally minutes. Augmented reality (AR) is a digitally enhanced view of the real world. 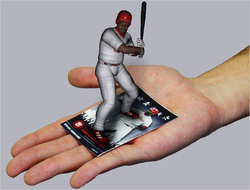 It can add layers of digital information on top of items producing a three dimensional aspect.. Within education it can be used to engage students and enable them to explore and manipulate objects solving problems as the go. Resources all all types can be embedded with “markers” that, when scanned by an AR device such as a phone or tablet, display additional information such as videos, text or 3D images. AR can enable students to visualise objects and interact with them exploring their features. To gain an overview of augmented reality, watch the short video opposite. Augmented reality apps and software are now being specifically designed for education needs particularly within science and were presented at a SSAT conference a few years ago. My students have always found difficulty mastering the VSEPR (Valence Shell Electron Pair Repulsion) Theory of shapes of molecules in particular the bond angles and number of bonded and lone pairs of electrons. I produced a cube template so that they will have the six key shapes available and can manipulate the molecules to view the geometry. I used Google SketchUp to build the 3D shapes and the Augment app to view them. A collection of 45 useful science education apps to enhance learning inside and outside the classroom. Microsoft Education Labs Flashcards. A useful tool for producing revision flashcards. Thoughts and ideas of new innovative technologies that can enhance learning and teaching in the modern day classroom composed using the SimpleMind+ app. 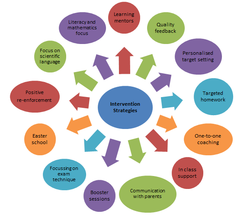 Intervention refers to putting in place strategies to help students to rectify any underperformance as soon as it is identified through regular, short focussed guidance and support. The most effective intervention is led by the subject teacher who has an in-depth knowledge and understanding of the student’s barriers to achievement and strategies they can focus on to improve their attainment. The intervention document contains information on how to approach intervention and strategies that can be implemented in order to ensure students reach their full potential. It is by no means a silver bullet as intervention takes an several takes many forms to tackle specific need of the individual students. The document outlines the monitoring and tracking procedures at each of the four level of intervention.